← Club Buys New Stand – On eBay! 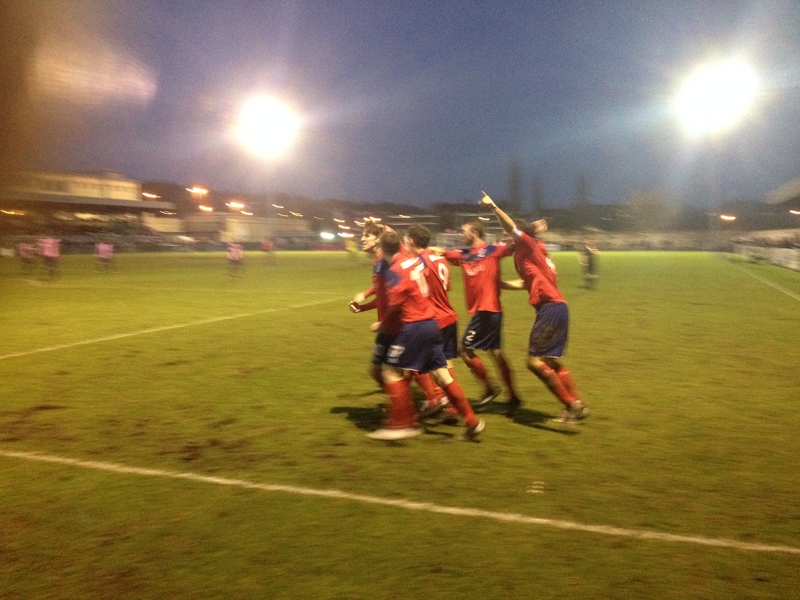 Charlie Moone took his season’s tally to thirty goals in all competitions with a brace as Hampton & Richmond Borough came from two down to draw with high flying Dulwich Hamlet in an eventful game littered with strange decisions from the officials. On a day which saw eight of the scheduled Isthmian League Premier Division actually go ahead, this game was in doubt on Friday. 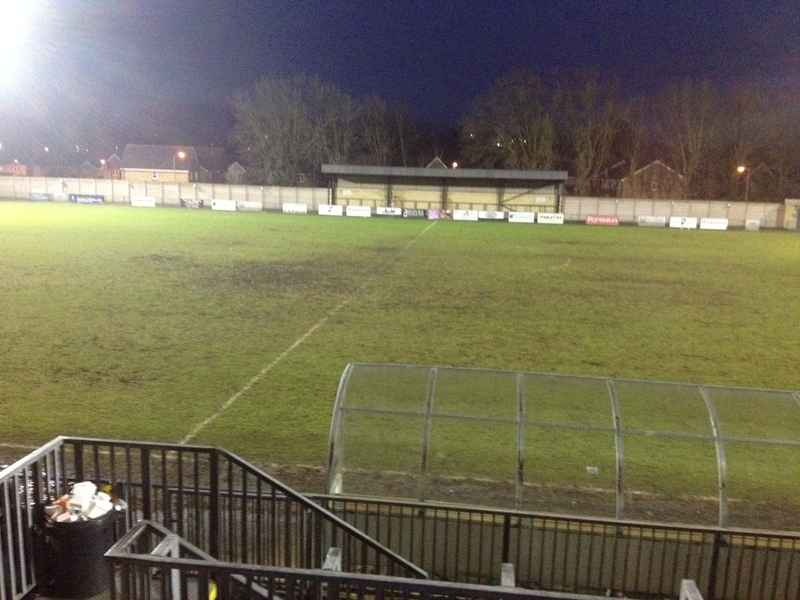 It was pretty much off as of Friday afternoon, but with a dry night and morning, no pitch inspection was required, and the game went ahead. And what a game it was! The only team change for the Beavers was enforced, with Karle Carder replacing Tom Hickey in central midfield. Hickey is recovering from a nasty broken nose suffered last week against Carshalton, and is hoping to return to action next month. Club captain Billy Jeffreys was serving the final game of his suspension, but aloong with Hickey, was at the game to support their teammates (and play football with my son prematch!). The first effort of the game came from Hampton, when Joe Turner surged forward from midfield before firing straight into the arms of Hamlet ‘keeper Yannik Nlate. The home side then asserted control over proceedings, with Rodney Chiweshe saving smartly from Nyren Clunis after a good move. Bizarrely, the referee gave a goal kick, even though I could see Chiweshe tipped it round the post, and I was behind the other goal! After ten minutes, the real moment of controversy occurred. A poor header from Justyn Roberts allowed Dean Lodge a clear run at goal. As he slid the ball round Chiweshe, the goalkeeper touched the ball away, and Lodge went over. The assistant referee, who had a clear view of the incident, put his flag across his chest and the penalty was awarded. Chiweshe was shown a yellow card, which is as baffling as the awarding of the spotkick. It was a clear goalscoring opportunity, and maybe indicates that the referee wasn’t convinced it was a foul in the first place. Anyway, Erhun Oztumer stepped up to slam the ball into the top corner to give Hamlet the lead. As has been the case a few times recently, Hampton’s players found themselves behind early on, and again they never let their heads drop. The ever impressive Luke Wanadio had a shot deflected wide, and from the second successive corner, joint manager Darren Powell rose to meet the ball, but his header flew narrowly over. However, the home side were certainly in the ascendancy, and Oztumer should have doubled their lead, but he somehow skied his shot from ten yards. It wasn’t long after the miss that Hamlet did double their advantage. Oztumer turned provider, playing an incisive pass to Clunis, and he finished clinically past Chiweshe. As I tweeted at the time, it was like a knife through butter. Charlie Moone had his first sight of goal just before half time, combining well with Dave Tarpey before hitting a fierce shot that unfortunately was straight at Nlate. Half Time: Hamlet 2 Hampton 0. It didn’t take long for Moone to get himself on the scoresheet once the game restarted. As he chased an awkward backpass, Nlate had to chest the ball down before attempting to clear. This allowed Moone to get in front of the ‘keeper and steal the ball. As he ran away from goal, he turned and shot all in one movement. The shot was unbelievably accurate, lifted over both Nlate and a defender on the line as it hit the top corner to send the travelling fans into raptures. It was a goal typical of a striker who’s bang in form. The goal sparked Hampton into a spell of dominance, with Tarpey miscuing a shot following a good move between Wanadio and Moone. Wanadio then came agonisingly close to levelling, curling a shot inches wide of Nlate’s left hand post. Hamlet always carried a threat, and Oztumer fired a long ranger straight at Chiweshe, before the ‘keeper pulled off his usual world class save, tipping over a vicious shot from substitute Jerome Walker. Hampton pushed forward looking for an equaliser, with substitute James Simmonds hitting three efforts off target, the best one hitting the side netting from the edge of the box. However, in the fifth of six added on minutes (where that came from is anyone’s guess) Moone capitalised on some slack defending to slot home and rescue a point that was very much deserved. There was still time for one final moment of controversy. As Hamlet looked to score an instant winner, Jerome Walker appeared to be fouled in the box, but the referee saw fit not to award a penalty. The draw keeps Hamlet fourth, while Hampton remain in eleventh, and unbeaten in seven league matches. 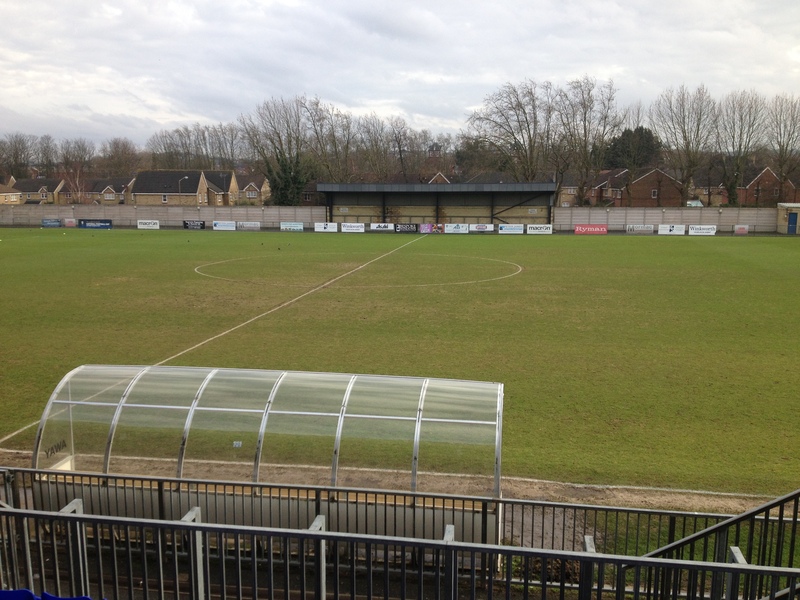 Dulwich Hamlet: Nlate, Samuels, Deen, Vidal, Adsniyi, Gonsalves, Clunis (Clarke 79), James, Lodge (Walker 72), Oztumer, Crook (Pinnock 85). Unused subs: Okoye, Daly. Cautioned: Oztumer. Hampton: Chiweshe, Brewer, Wells, Lake, Powell, Roberts, Wanadio (Harris 78), Carder (B Simmonds 84), Tarpey, Moone, Turner (J Simmonds 69). Unused subs: Mills, Brewster. Cautioned: Chiweshe, Carder. 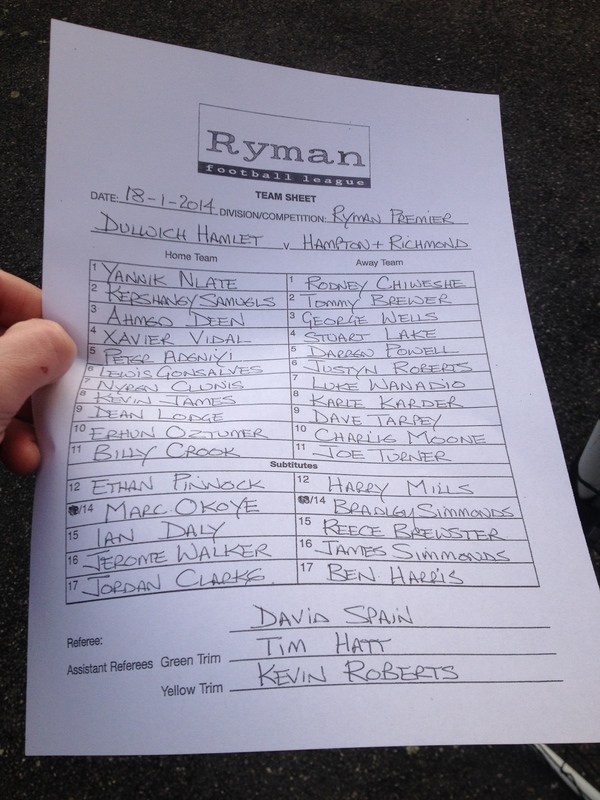 Posted on January 19, 2014, in UTL Archive and tagged Charlie Moone, Dulwich Hamlet FC, Erhun Oztumer, Hampton & Richmond Borough, Isthmian League, James Simmonds, Ryman Premier. Bookmark the permalink. Leave a comment.